I can’t tell you how exactly long I’ve wanted these sheets… I liked to browse the anthropologie.com sale section periodically, you know, just in case they had decided to put them on sale. Due to their price, they were never a set I could justify, but thanks to my generous sister, they’re now at home on our bed. What’s even better is that they came packaged in a fabric bag, made of the same floral print (I’m not sure who ever manages to fold their sheets neatly enough to get them back in a small bag… certainly not me!) So of course my immediate thought was that I could use the fabric for a quilt. I paired it with a couple prints and a couple solids, and decided to make up several improv blocks, using a piece of the floral sheet print in each block. In addition to the floral print, I decided to use a striped section in each block as well. I initially thought I’d do a standard layout with blocks of the same size, but when it came time to lay it out, I decided to let them fall wherever they wanted and fill in the extra spaces with the remaining prints and solids. While this method certainly took longer, I like the randomness of it and I think it’s a fun change from a standard block layout. To go along with the floral theme, I decided to try out Elizabeth’s dogwood free motion quilting. And wow, I loved quilting it and I love the way it looks on this quilt. If you haven’t tried it, you should! For sure. This entry was posted in [search] Square-in-Square Quilts, [search] Wonky/Improv Quilts, Posts about Quilts, Quilts and tagged anthropologie.com, baby quilt, dogwood quilting pattern, floral, handmade, nosegay sheet set, oh fransson, quilt. Bookmark the permalink. 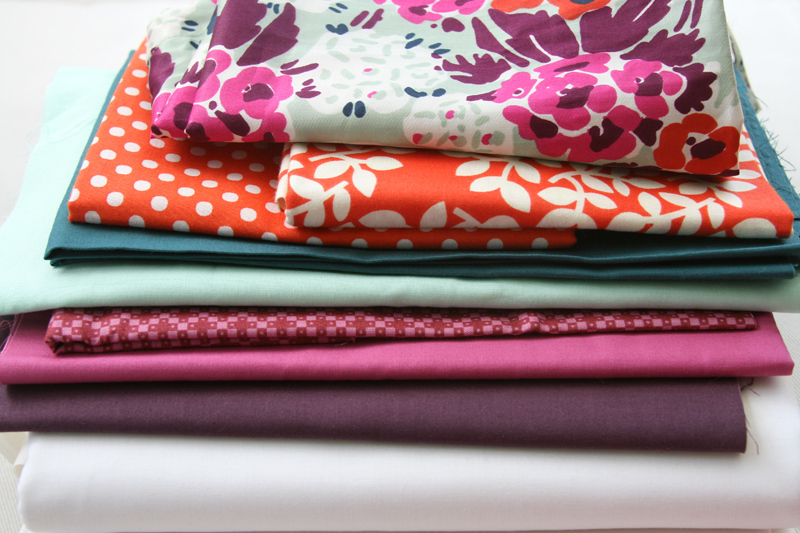 Kona Modern Quilts – a giveaway! I have a few saved fabric sheet bags as well that I’ve been saving for a special project–I always thought I was the only one who does that! You were savvy to use every bit of something you love. How nice of your sister to make a little dream come true AND you got a bit of fabric to make a quilt too! as knitting bags ~ they are perfect for larger projects. oh this is so awesome! So cool it matches with the sheets – I bet you are sleeping happy now! Phew, at the price they should come with a bag and a maid to make the bed! 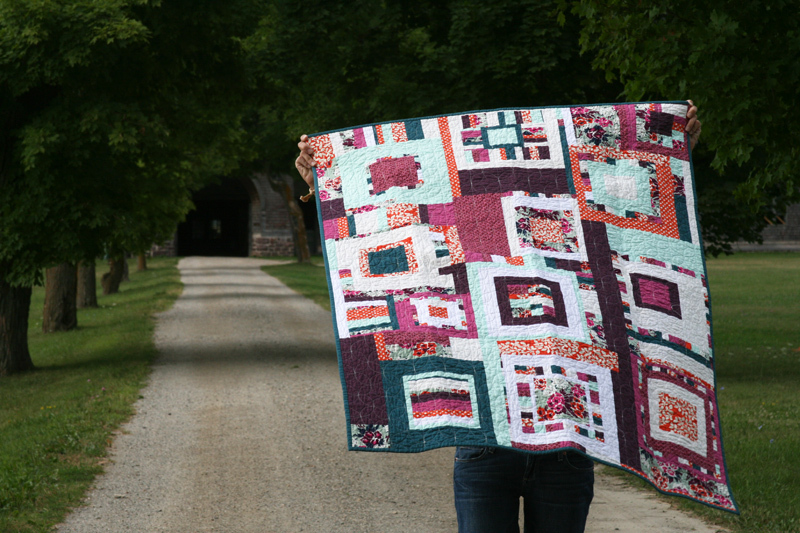 I love the quilting, too; it suits the quilt perfectly. You are mighty brave to quilt a king by yourself!! Wow! 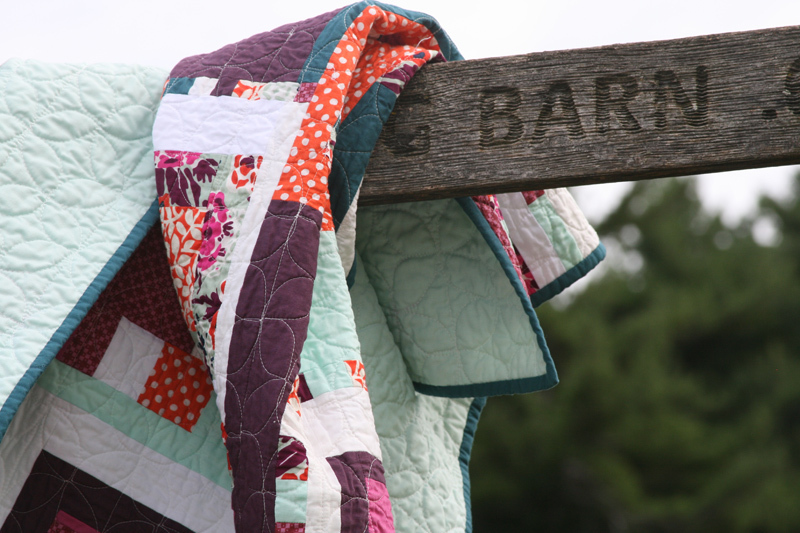 Love the quilt and quilting! I love the sheets too. What a awesome sister to buy them for you. Dynamite quilt! I love it. i love it! it came out so lovely – and that was so sweet of your sister to get the sheets for you 🙂 wow, i’m so jealous of your views too! What a stroke of genius! The colors and the block layout are great! Love this quilt and what a lovely sister. Wow, inspired idea to use the fabric bag! And all finished so quickly! Ooooh! That came out so pretty! So glad that you were able to use the dogwood quilting. I also LOVE the way it looks on the back. Love it! But I’ve been drooling over those sheets, too! Generous and sweet sister you have there! Love those colors! Amazing quilting! What a fun quilt. I know it must look fabulous with those sheets. Your work always inspires me. It’s gorgeous! I just finished reading your blog from the very beginning. You are so inspiring. 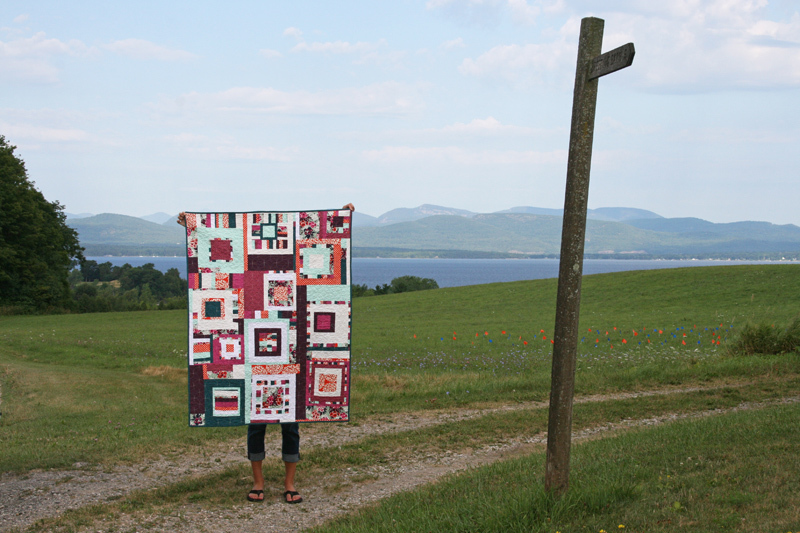 I’m so glad that you’ve blogged your quilting journey. It’s given me great hope that with lots of practice and more time I’ll be able to make quilts like yours. 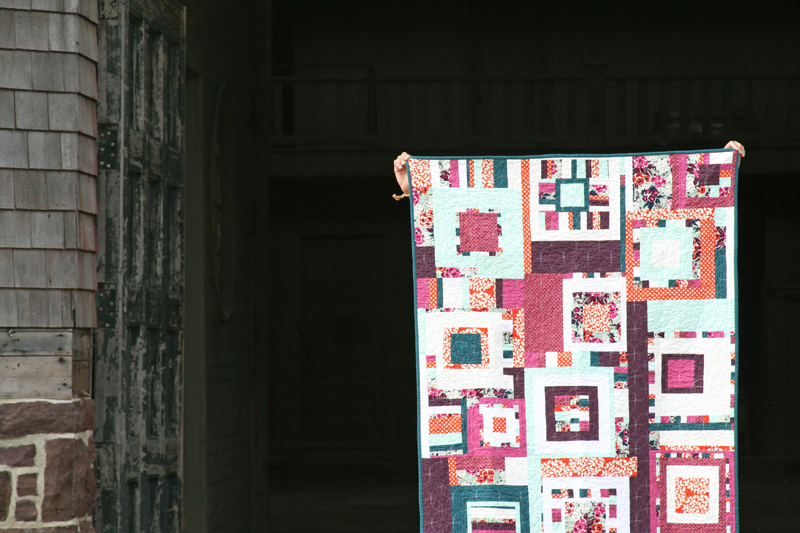 Wowza, you make such beautiful quilts! I love them! Thanks so much for sharing. This quilt is absolutely amazing . I love the way you were clever using the bag . You put together that quilt in a way that just works so well . I love everything about it . I wish I could make an improv quilt but even after staring at yours I just don’t get how you work it out once you’ve made the focal blocks . Ha ha . I’ll have to do a search . Well Done . 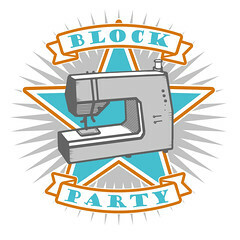 Ps I love your blog . You are humble but so talented ! 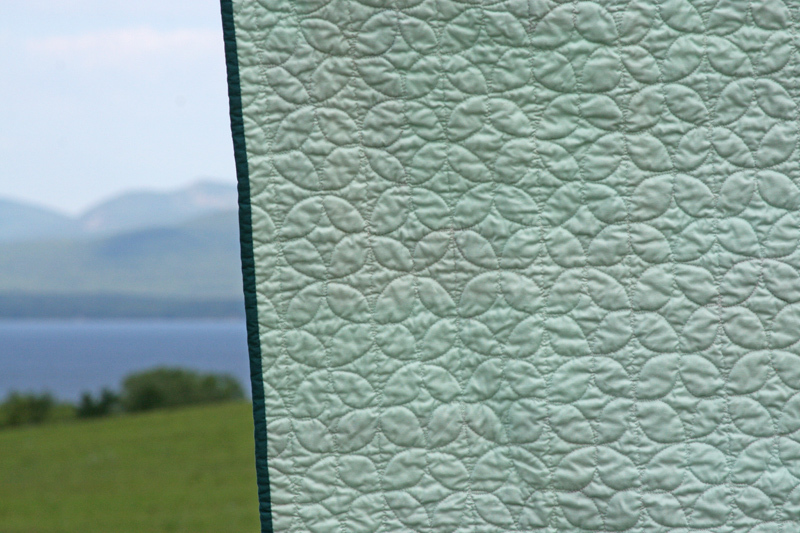 this quilting pattern is going to be kind of your signature.. how nice! it looks absolutely fab, especially on the solid back, love it!! Beautiful quilt! Love the colours, design and quilting! 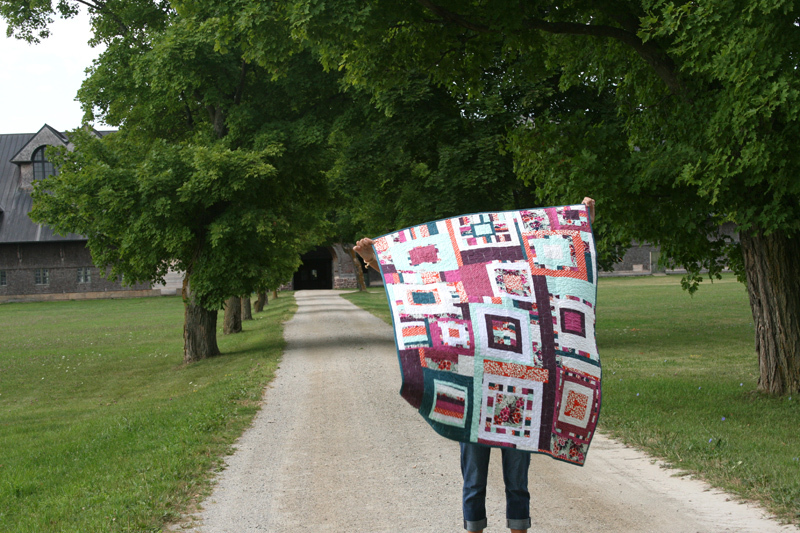 Once again your signature creativity shines through in this one of a kind quilt. 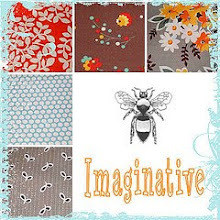 You’re my favorite inspiration to keep on quilting! Love your unique choice of colors, too. Oh, I’ve been wanting to try that quilting pattern. Thanks for the good report! i love the randomness of the block layout! great quilt. the color scheme is so fresh. and the quilting is fantastic!